Over 100 SonicWALL field people have been brought up to speed on the IPFIX capabilities of their next generation firewall. This includes training on configuring SonicWALL IPFIX and NetFlow. “As a Sonicwall system engineer, I’d have to say the level of support and rich reporting Scrutinizer provides to SonicWALL customers is phenomenal. So far, Scrutinizer is the only product on the market to report on all the unique template data we export via IPFIX. For example, Sonicwall is able to provide insight to actual users, applications (not just port based ones), urls, IPS events, and tons more via IPFIX. 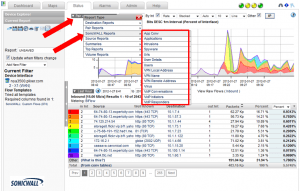 This functionality really helps network admins with regards to troubleshooting, reporting, and capacity planning. Further, Scrutinizer provides additional situational awareness of securtiy and network events with the Flow Analytics module.” Rob Andrews – SonicWALL Systems Engineer. SonicWALLs export over a dozen IPFIX templates with rich details that allow Scrutinizer to provide reports not yet available from any other vendor. The team at Plixer worked with the SonicWALL software engineers early on in the development process. SonicWALLs version of Scrutinizer retains all of the network monitoring support we have built in for Adtran, Cisco, Citrix, Enterasys, nBox, Riverbed, Vyatta and others. With the recent acquisition of SonicWALL by Dell, Scrutinizer will provide continued value with Dell sFlow support.